Suffice it to say, they were not close. 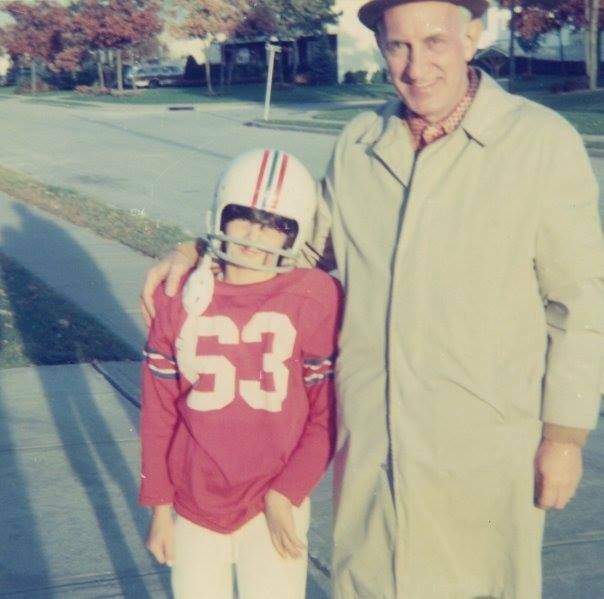 Despite having a rough childhood, and I mean rough childhood, my grandfather always loved his father even though there was plenty there to hate him for. You wouldn’t necessarily know it because my grandfather wasn’t the type to be overly affectionate or sentimental. He was a man’s man. However, despite his rough exterior, I will also never forget the glowing nature of how he spoke about others. My grandfather would never tell you that he was proud of you to your face but you could bet your bottom dollar that he would tell the rest of the world. I remember hearing my grandfather speak with pride about how his father was a respected police officer for the New York Police Department. I remember him bragging about how his father was the President of the NYPD Holy Name Society. I remember him talking about how his father would host bigwigs for dinner, from the respective realms of the good, bad, and the ugly. I also remember that there wasn’t much more than that. The stuff he didn’t speak about was painful to even think about. I heard bits and drabs over the years from my grandmother, my father, and my aunt. However, my grandfather’s disdain for his father was more than apparent. At this point, you’ve read 275 words. I think you can get the picture. As a kid, my image of my great-grandfather was purely negative. He was described to me numerous times as a drunk, a womanizer, and a violent man…someone to not be proud of. 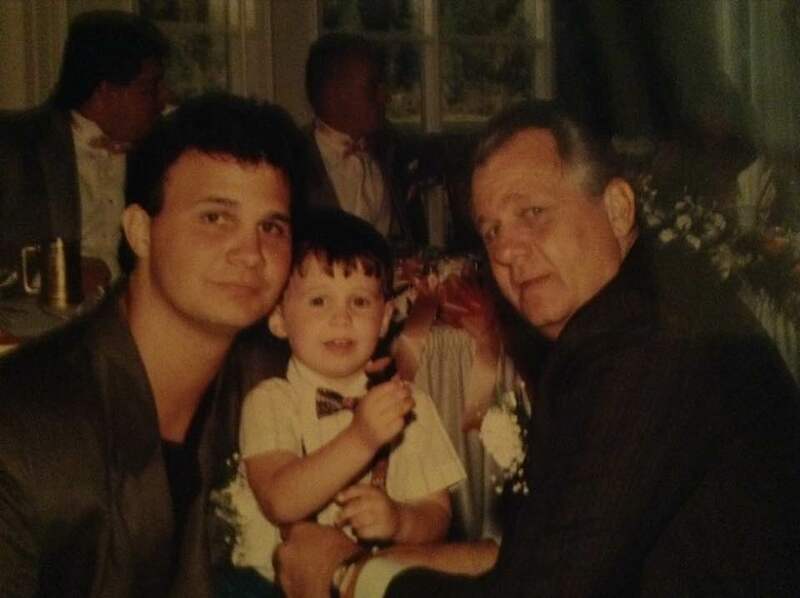 In fact, the only story my father really recalls about his grandfather John William Achnitz is that he tried to give him a hug at the time when his wife (my father’s grandmother) passed away. John said, “Billy, I am your grandfather.” My dad replied, “No, my grandfather died 4 years ago,” referring to his other grandfather on his mother’s side. Naturally, I understood why my father didn’t like his grandfather and in reality why he didn’t even recognize him as his grandfather. My dad hated seeing his father hurt. 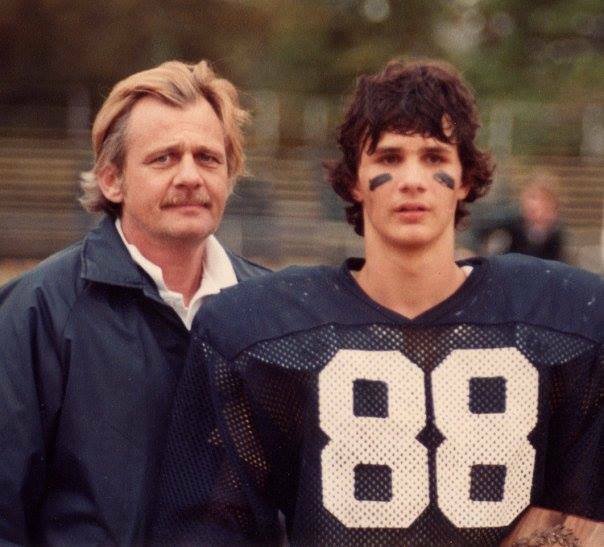 And like any son, he was going to stand by his father. In a way, my grandfather was robbed of that same opportunity. He never really got the chance to stand by his father although I know deep down my grandfather always loved his father. Despite all of John’s faults and indiscretions though, I came to see him in a much different light by learning more about him through genealogical research. 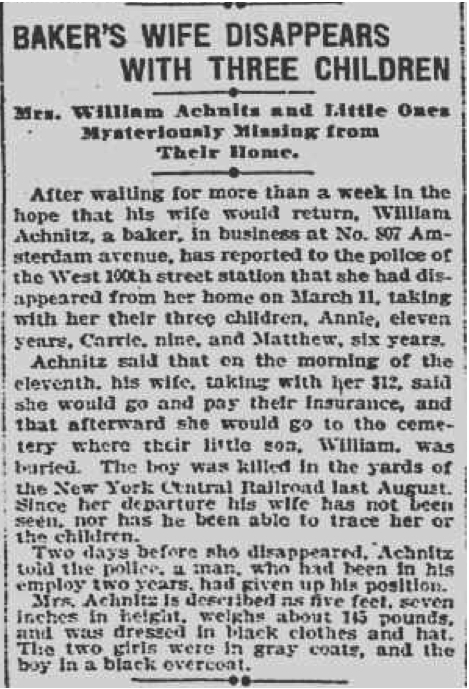 In fact, I can distinctly remember the day that my grandfather discovered a New York Times article from 1902 about the death of John’s half-brother William Achnitz just by googling his own name. At the time, he had no clue who this William was and I don’t think John ever knew about him either. This tragic event, which I’ve posted about before, was the key to John’s existence. It is the key to my existence. In fact, everyone alive today that is descended from John is only alive because of William’s death. I know that sounds like a terrible thing to say, but it’s true. John’s life, and hence my own is predicated on this one event taking place, for after that event, John’s father, the very first William Achnitz, not only lost his youngest child (at the time) to a tragic train accident, but his wife with their 3 remaining children and a coworker of William’s all disappeared. Turns out they all went to Australia and there is no telling whether William ever figured that out. For all he knew, they could have all died. Nevertheless, he lost it all. He lost his business, he lost his wife, he lost his son, and he lost his other children. He lost his entire family and potentially he could have lost his sense of self and purpose too. He went from owning his own industrial-scale bakery on Amsterdam Avenue in Manhattan to working the rest of his life as a janitor. He did remarry though. 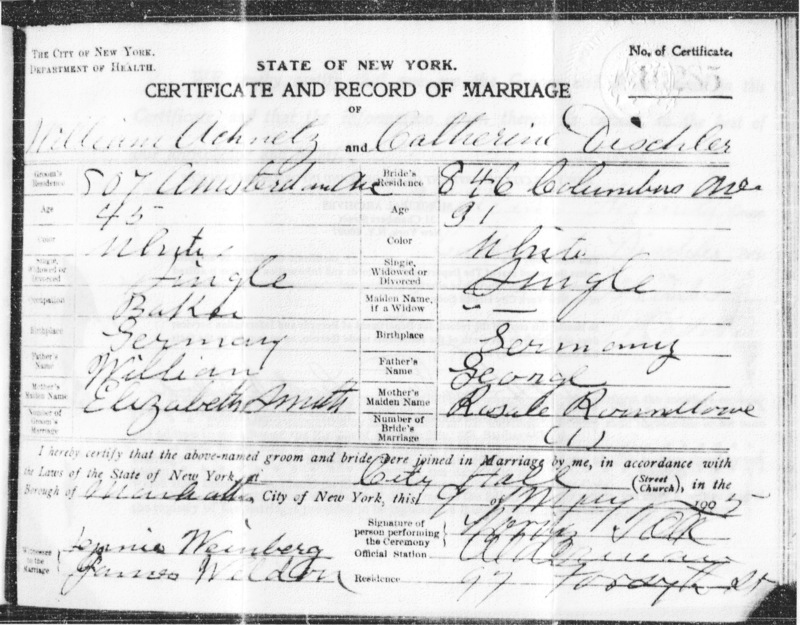 In 1905, he married my great-great grandmother Katherine Achnitz. 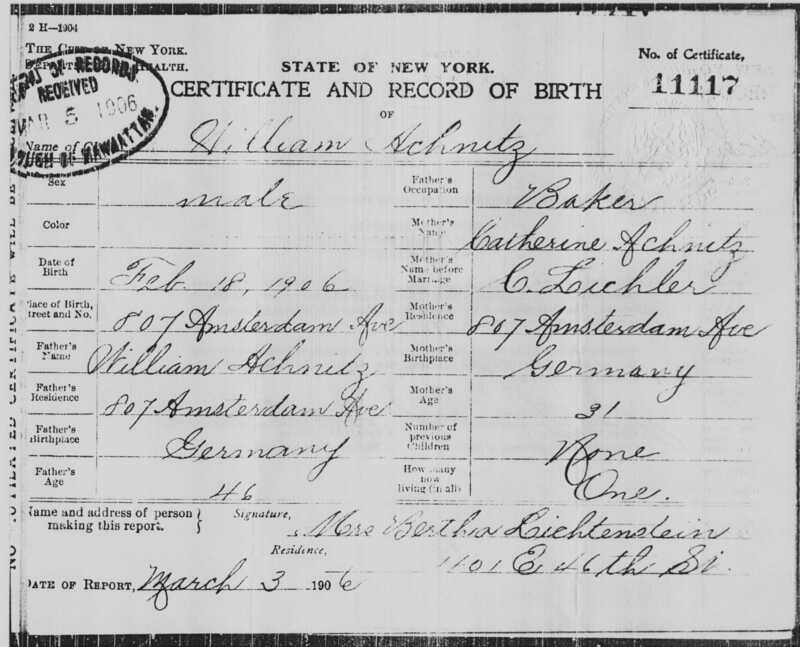 In 1906, they had their first and only child together John (although he was born with the name William, which he later used as a middle name). I’ve often wondered if John did this as a result of finding out the real story behind his father’s first family. I could definitely understand the possibility that he may not have liked the fact that he was clearly named after his half-sibling that had passed away 4 years before he was born. John Achnitz was actually born William Achnitz on February 18, 1906 in Manhattan, New York. He later used the name John with William as his middle name. Wondering how John became the father that he was, I often wondered what John’s relationship was like with his father, William. It was certainly short-lived as John lost his father in 1923 at the young age of 17. Did William losing his family and his business turn him into a monster of a person? Was he already a monster of a person and that’s why his family left him in the first place? Whatever the answer is, John was clearly not prepared to be the best father that he could have been. Perhaps, John thought that it was best for him to be as absent as possible. In a way, thinking that this would be the best way that he could be a father to my grandfather and his brothers. Certainly, he wouldn’t have been the first father to ever do this. Whatever was going on in their heads at the time, I like to think that John did the best he could given the cards that he was dealt with as a child. The analogy that I like to use to describe the Achnitz men is that each Achnitz generation has been dealt a better hand over time. And as an avid poker player, I know that my grandfather would really appreciate that analogy. He was certainly dealt a slightly better hand than John. My father was definitely dealt a better hand than my Grandpa. I’ve definitely been dealt a better hand than my Dad. And it is my hope that my kids one day will be dealt a Royal Flush. I honestly never thought that I would end up visiting my great-grandfather John. And I don’t think anyone in my family has ever visited him. In fact, they didn’t even know that he had died at first. My grandfather found out several months after the fact after his second wife Blanche had told one of my grandfather’s brothers. This absolutely tore my grandfather up inside. I don’t even think that my grandfather ever even got to visit his dad’s gravesite. So, in a way, I felt like this was my opportunity to make amends and forgive him for any and all mistakes that he had made in his life not to mention, pay my respects. I sat down in the grass right next to his headstone for about 30 minutes and just prayed. 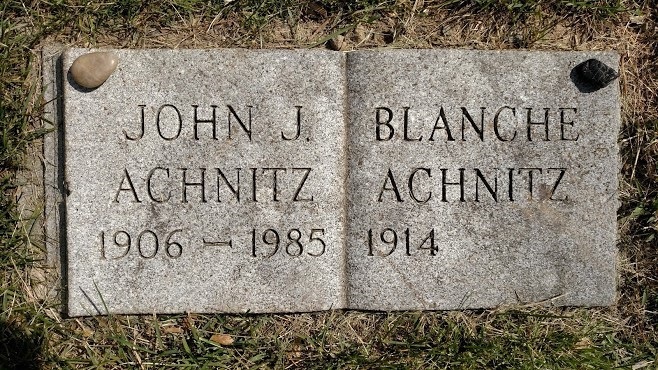 John William Achnitz died on October 26, 1985 and was buried with his second wife Blanche in Valhalla, New York. I prayed that he was in a better place and I prayed that he was somehow able to be the father to my grandfather that he always wanted him to be. I remember the sun shining brighter in that moment and I remember getting a warm sensation throughout my body. It’s moments like that that have made me believe in something deeper than life. I told him about myself. I told him about how I was on my way up to Buffalo to watch my wife graduate with her Master’s degree. I told him what I knew about him. I told him how I was the only one that had figured things out about him that perhaps no one else had figured out. I asked him to always be a part of me, which after thinking about it further, I realized he’s always going to be a part of me. I just hoped that in some way, both him and my grandfather were truly at peace. Sons may end up having issues with their fathers in life and all of us may have to live with the sins of our fathers. However, that doesn’t mean we can’t make every effort to have the best relationship possible with them. That’s what I certainly strive for with my own father. John, his wife Veronica, and three youngest sons: my Grandpa (standing in back), Frank aka Spike (in middle), and Bobby (to the right). 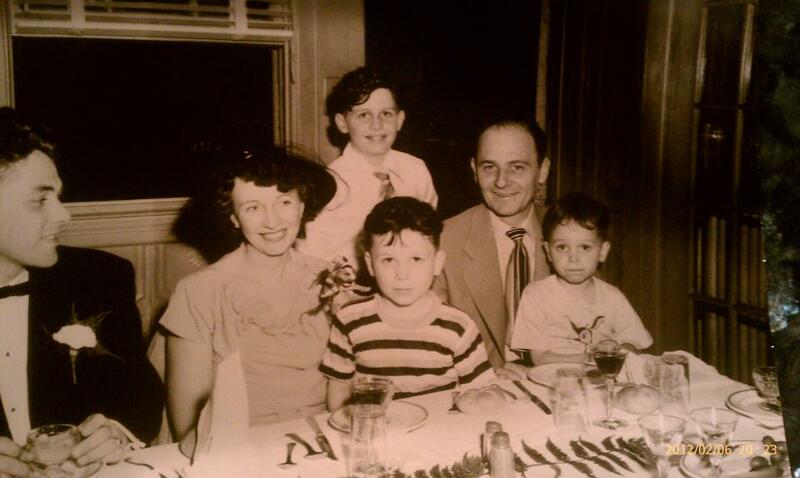 This photo was taken at their oldest brother Jack’s wedding on May 21, 1950. 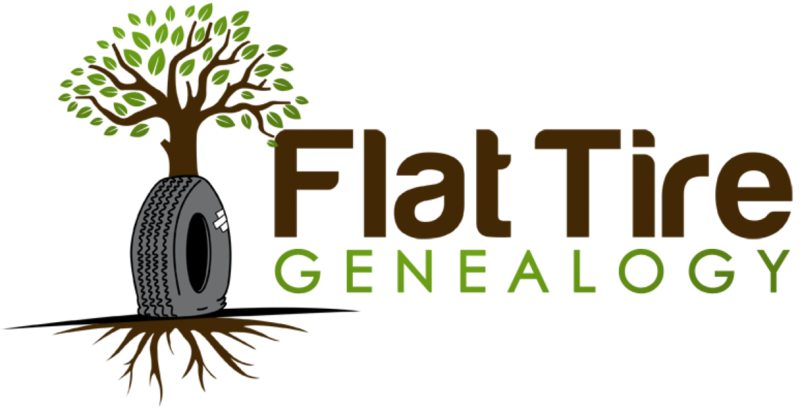 This is why I love genealogy. You uncover stories and you can truly learn about yourself in the process. 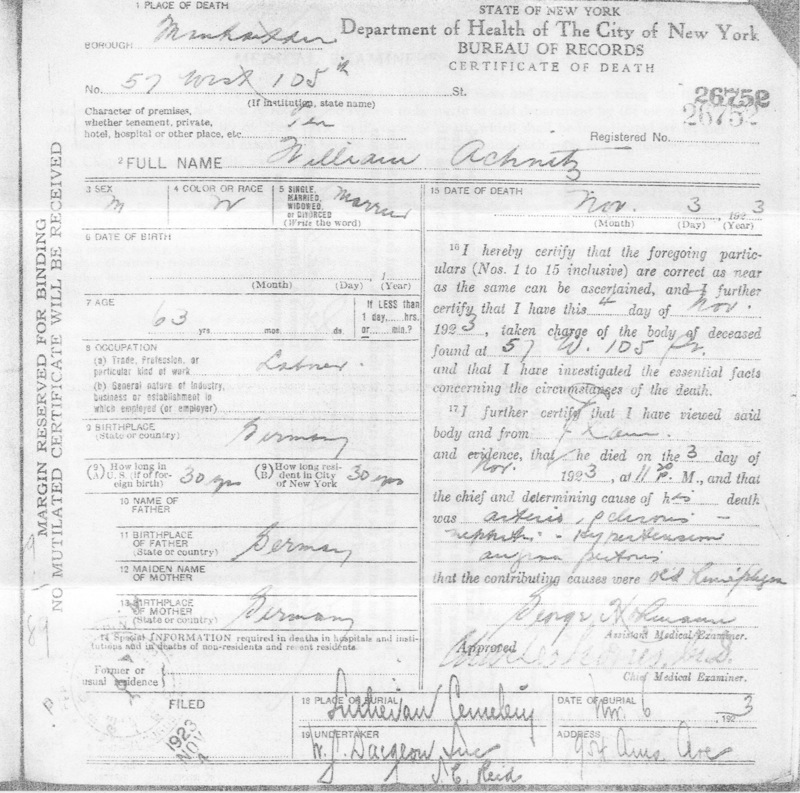 If you are related to John William Achnitz, he is buried in Kensico Cemetery in Valhalla, New York. Until next time, keep on digging.